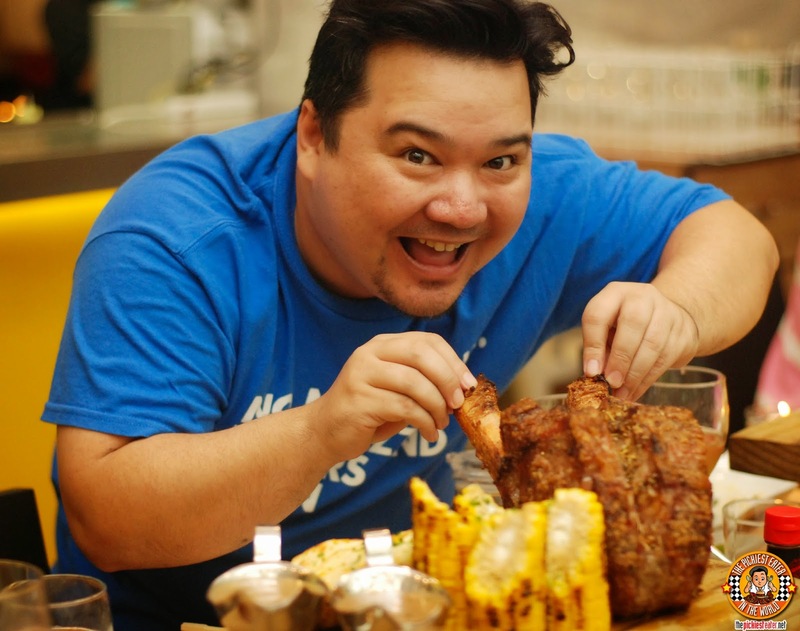 THE PICKIEST EATER IN THE WORLD: TORCH: SETTING GREENBELT 5 ON FIRE! Torch is a restaurant that I've been wanting to go to for quite some time, but never got around to going. Rina constantly raves about it, but we never got to visit. In fact, she still has a Torch Gift Certificate from her visit at the San Juan Branch from two years ago kept in our little tin can of GCs. 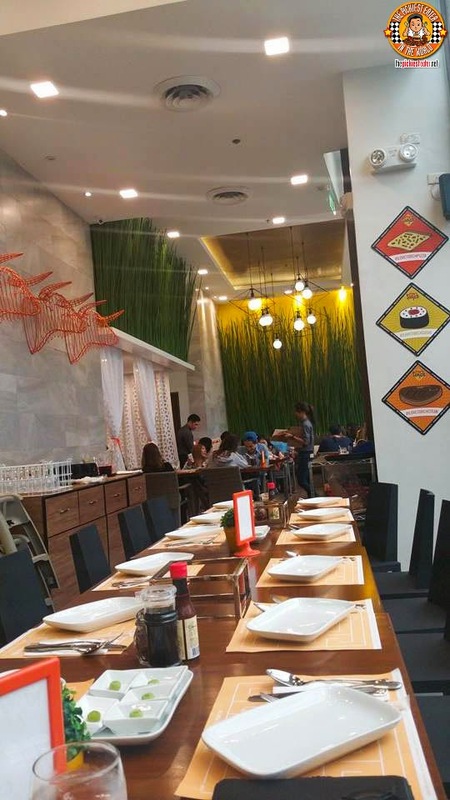 The Torch Restaurant brand has emerged as a legitimate player in the local chain restaurant scene, and now has a total of four branches - San Juan, Trinoma, UP Town Center and now, Greenbelt 5 around the metro. I was invited to finally get a taste of the Torch experience for myself, and try 8 of their new entrees! Although I was elated to finally try Torch, my heart broke a little when I found out that Torch rose from the ashes of what used to be Mr. Jones.. A restaurant that I was very fond of when it first opened. Like Mr. Jones, it maximizes the rather narrow dining area inside, using cool, soothing tones to create a relaxed vibe for dining. An Al Fresco area is available, helping to accommodate more customers. 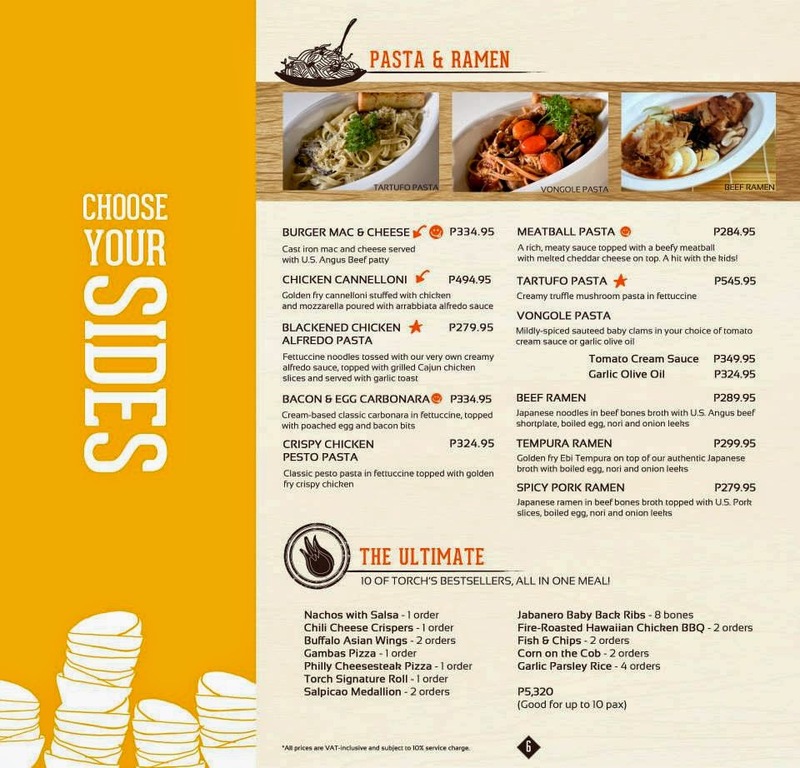 Something I immediately noticed about Torch was how extensive the menu is! There is definitely something for everyone! 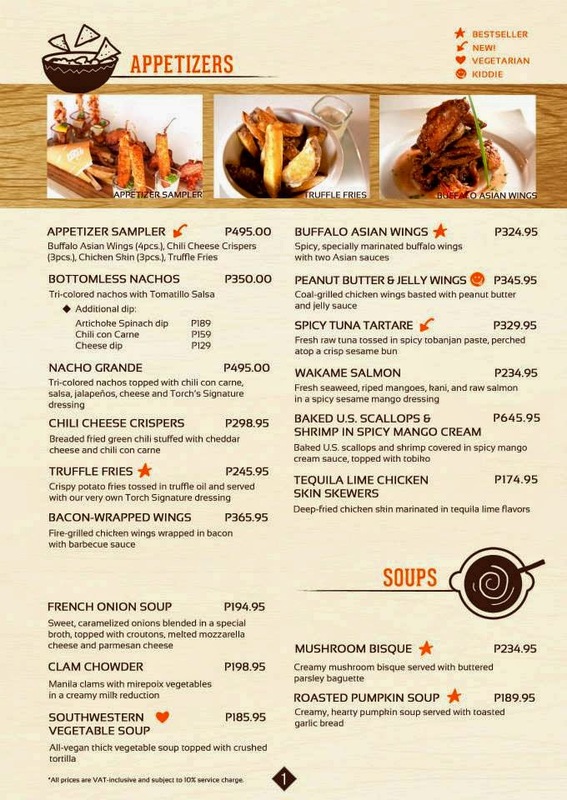 There aren't very many places that have Pizza, Ramen, Tocino, and Chicken Curry, all on the same menu, but Torch is one of them! 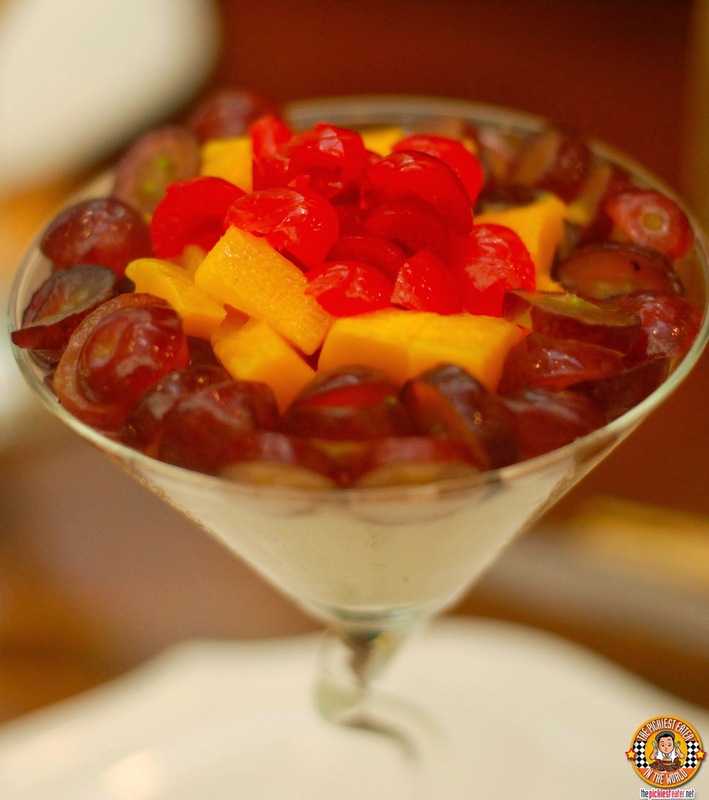 Before we began, our server brought out a punch bowl, filled with Torch's Dragon Sangria (P899.95 good for 3-5 ppl). 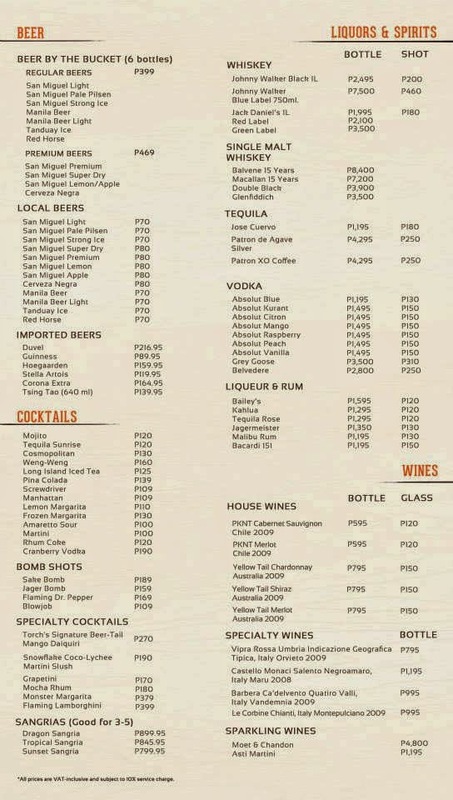 I don't drink but with the way my friends were downing these by the glass (cough cough foodreviewsmanila cough cough... dude4food cough cough), you'd think they were sipping the nectar of the gods. 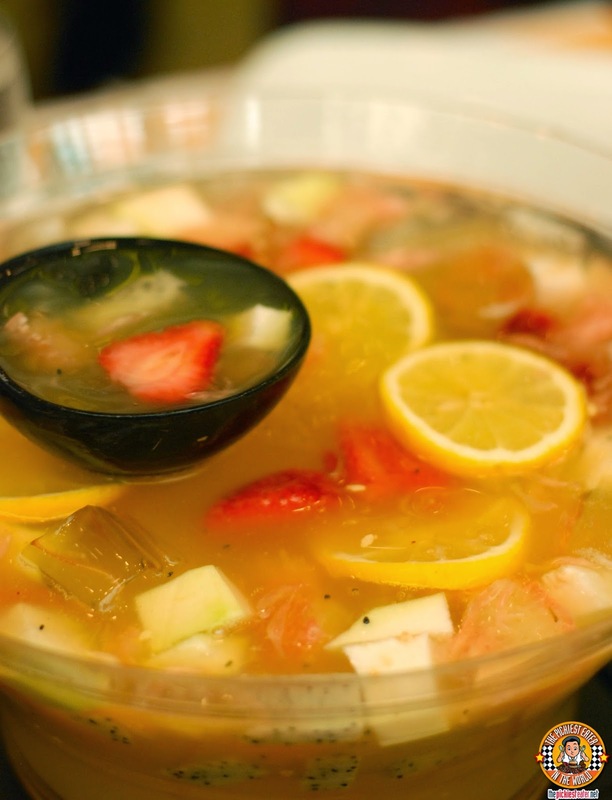 The Dragon Sangria is made with a medley of fresh fruits, Chamdor and Chardonnay. 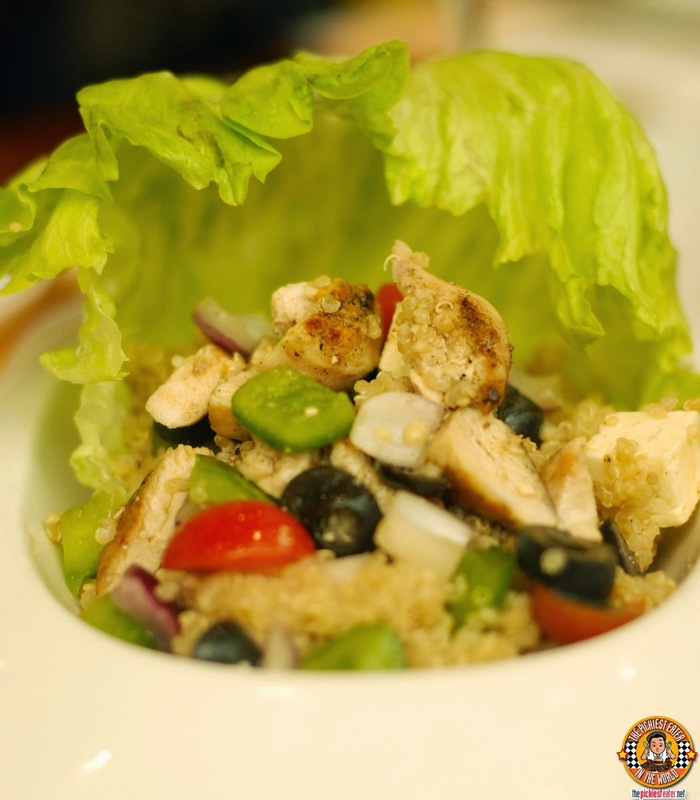 I think I've made it clear that I'm not a fan of Salads, which is why no one seemed to question it when I passed on the Grilled Chicken Quinoa Salad (P345.95). Grilled Chicken , Onions, Bell Peppers, Feta Cheese, and Quinoa Grains, tossed in a Sesame Dressing. 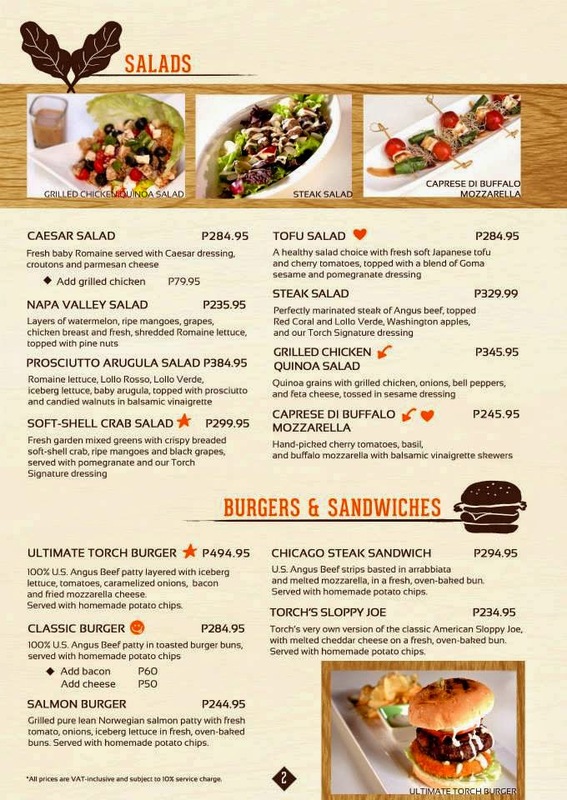 Things kicked off for me with the Appetizer Sampler (P495), which features the best of the best of Torch's impressive starters menu. 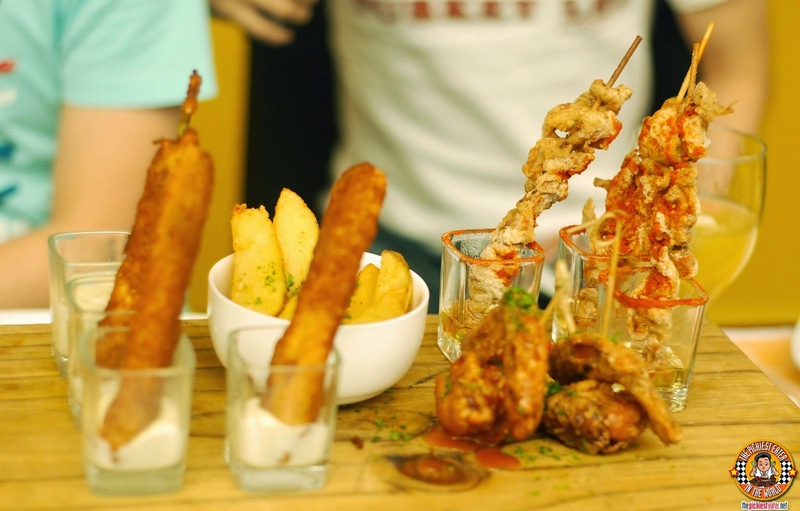 The platter consists of Chili Cheese Crispers, which is Green Chilis stuffed with Chili Con Carne, then coated in a light breading before being deep fried to a beautiful golden hue. The second item on the sampler is the the Buffalo Asian Chicken Wings. Juicy wings, soaked in Torch's Spicy Buffalo marinade, before dropped in the deep fryer. The third dish is the Tequila Lime Chicken Skin Skewers. I am a sucker for chicken skin, so it was what I first instinctively grabbed. The skin itself had a nice zestiness from the lime tequila seasoning, while maintaining a wonderful crunchiness at the same time. The final item was the Truffle Fries, in which I was powerless to its lure. Deep fried potato wedges, tossed in a drizzling of truffle oil. I was seriously contemplating stuffing the entire bowl into my mouth right then and there. 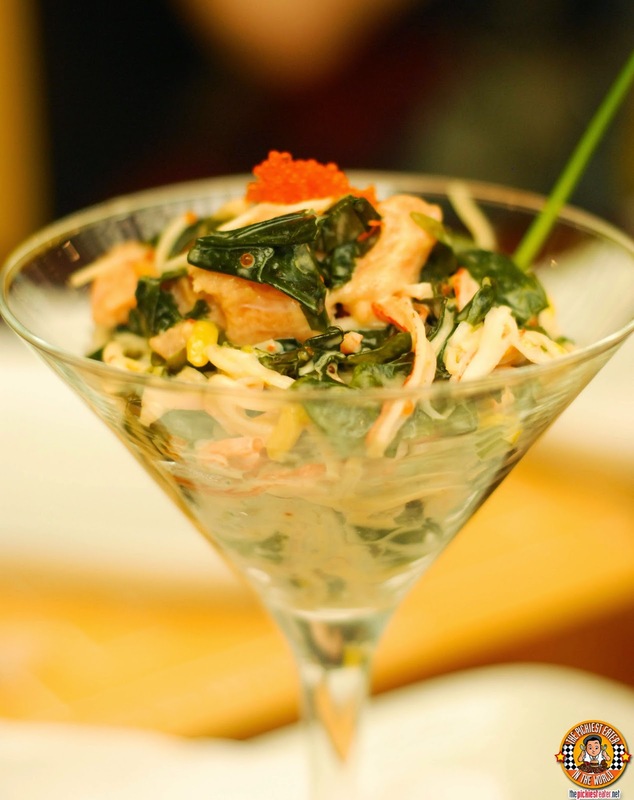 The next dish we were served was the Wakame Salmon (P234.95) is minced raw Salmon, and a combination or shredded Kani, ripe mangoes, and fresh seaweed, tossed in a Spicy, Sesame Mango Dressing. Not my thing, but my companions really seemed to enjoy it. I don't like sushi, mainly because I don't the taste of seaweed and raw fish. 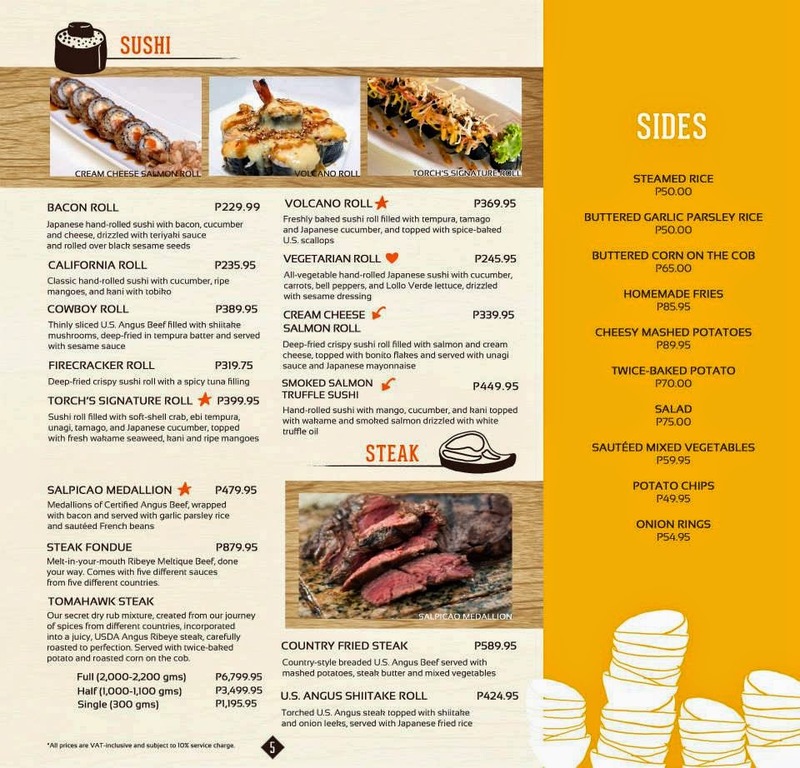 But I have to admit, I actually liked the Cowboy Roll (P389.95). 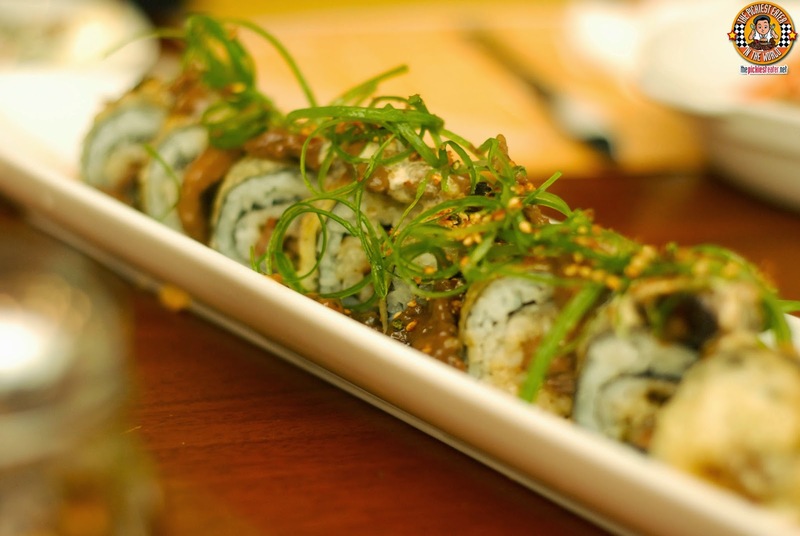 Yes, it's not your stereotypical Japanese style sushi. It's more of a Western Fusion, with thinly sliced Angus Beef replacing the raw fish. and the rice roll filled with Shiitake Mushrooms, and deep-fried tempura batter, and served with sesame sauce. Something Rina gushed about when she visited Torch the first time was the pizzas. I was elated to see that our hosts brought out a Cheesy Anchovies Alfredo (P374.95). 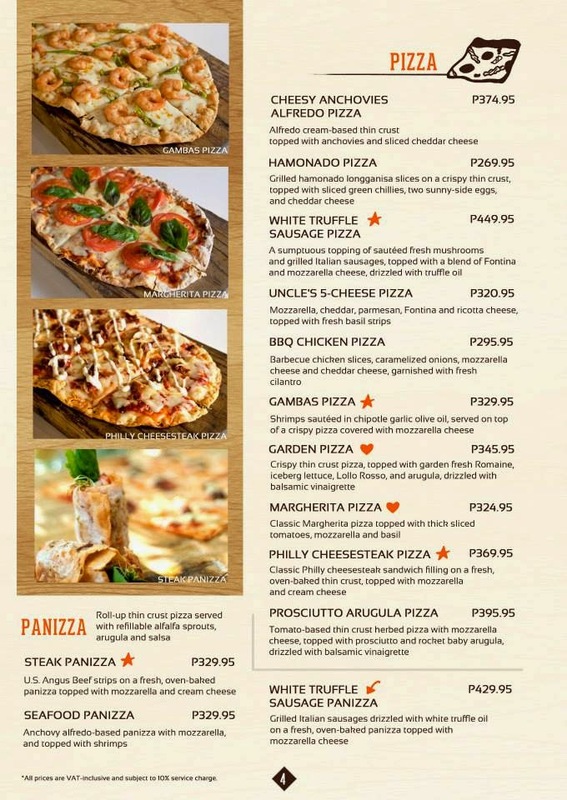 I'm always looking out for a good non-tomato based pizza (and Italian food in general), and I found a pleasant surprise here. 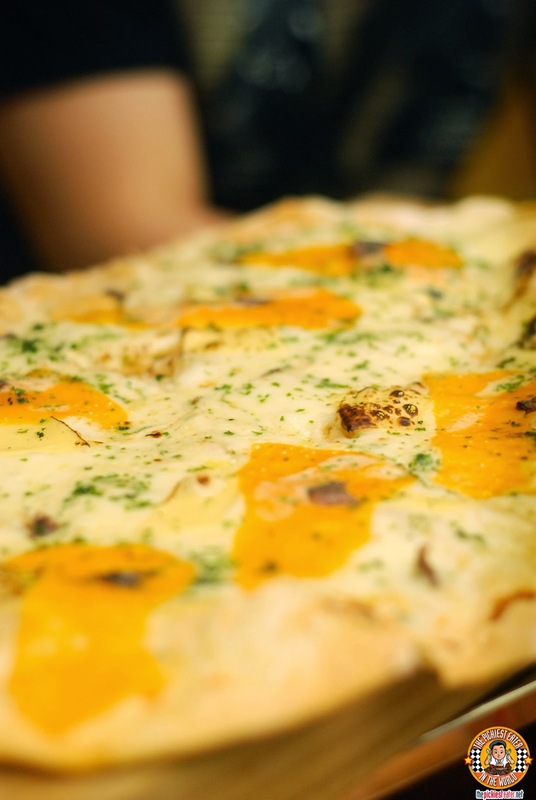 I say a surprise, because I am not fond of Anchovies so much, but the infusion of it into the cheese gave the pizza a delicate sharpness, making it ever so tasty. The crust was thin and let out a nice crack with every bite, which was absolute music to my ears! 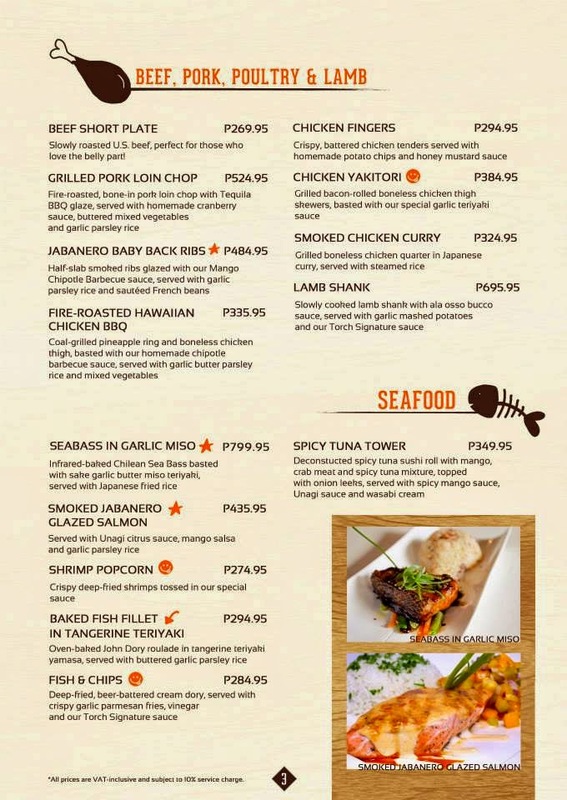 Something that knocked me for a loop was the Sea Bass in Garlic Miso (P799.95). Contrary to what people may think, I actually do eat fish, and Sea Bass is one of my favorites. Gorgeous Sea Bass Fillets are basted in a Sake Garlic Butter Miso Teriyaki sauce and infrared-baked to excellence. 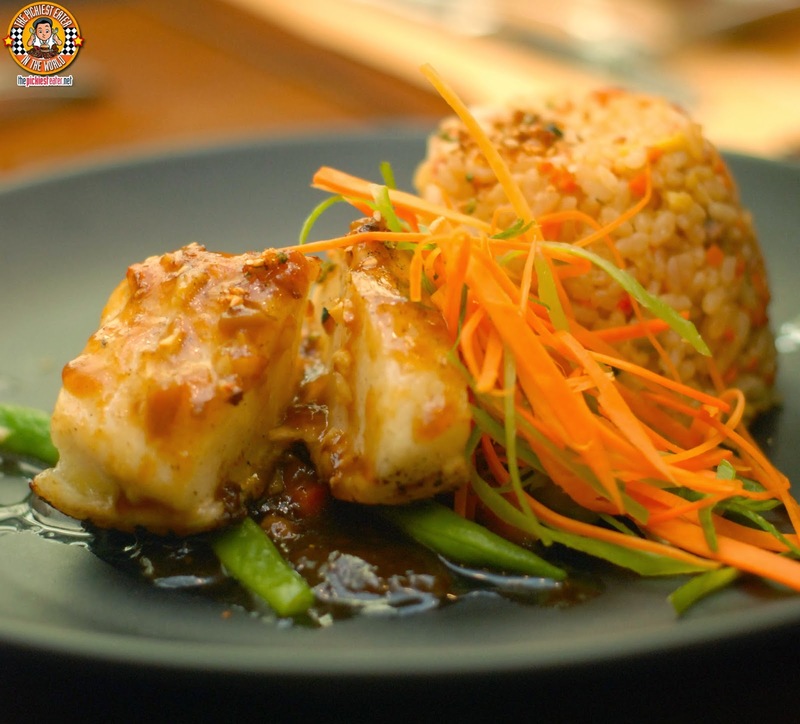 The fish meat is pillowy soft, and works wonders with the sweetness of the buttery Teriyaki sauce, which pairs perfectly with the Japanese Fried Rice. 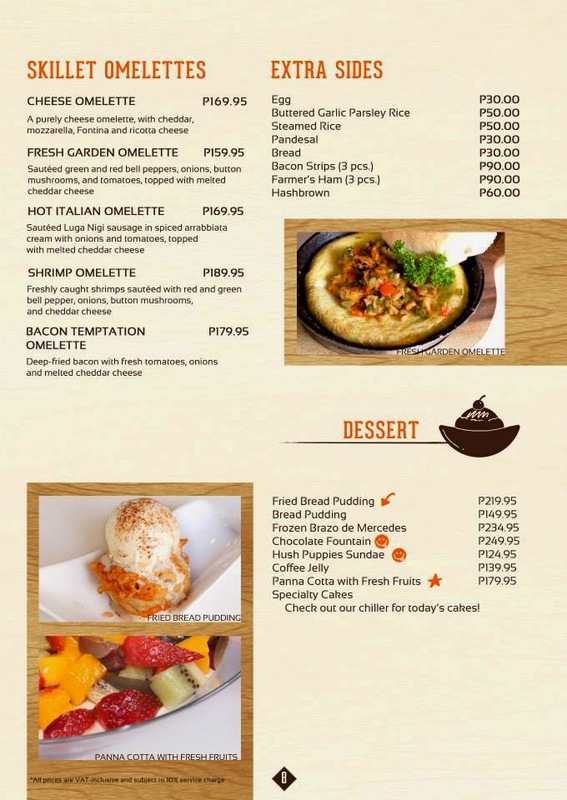 My quest for non-tomato based Italian dishes continued with the discovery of Torch's Bacon and Egg Carbonara (P334.95). A bed of fettuccine pasta covered in a creamy carbonara white sauce, Then topped with strips of bacon and perfectly cooked poached egg. 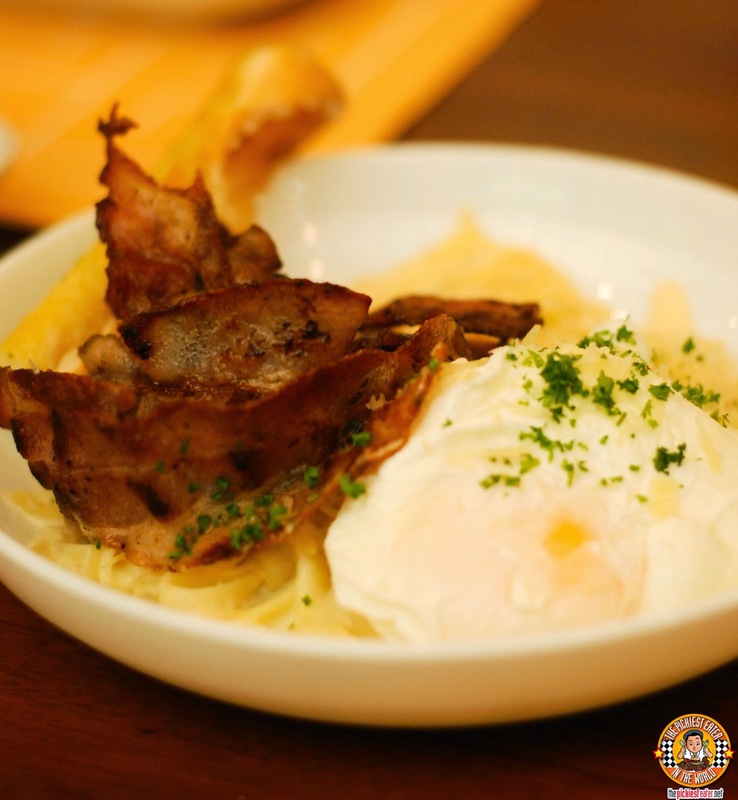 I just loved how the innate smokiness of the bacon cut through the creaminess of the egg and carbonara sauce, giving the dish a wonderful balance of flavors. Bacon and Egg Carbonara from @torchresto.. thats one gorgeous looking egg, and DANG is that bacon awesome!! Check out how gorgeous it is when you mix it all together! In these blogger events, the restaurant usually brings a couple of plates of a certain dish for everyone to share. 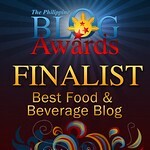 The point is for the blogger to taste the dishes of the restaurant, and not exactly to get ourselves full. The Tocino Fingers (P172.95) was one dish that I didn't want to share with any of those suckers I was with that day (I don't know them so well anyway). 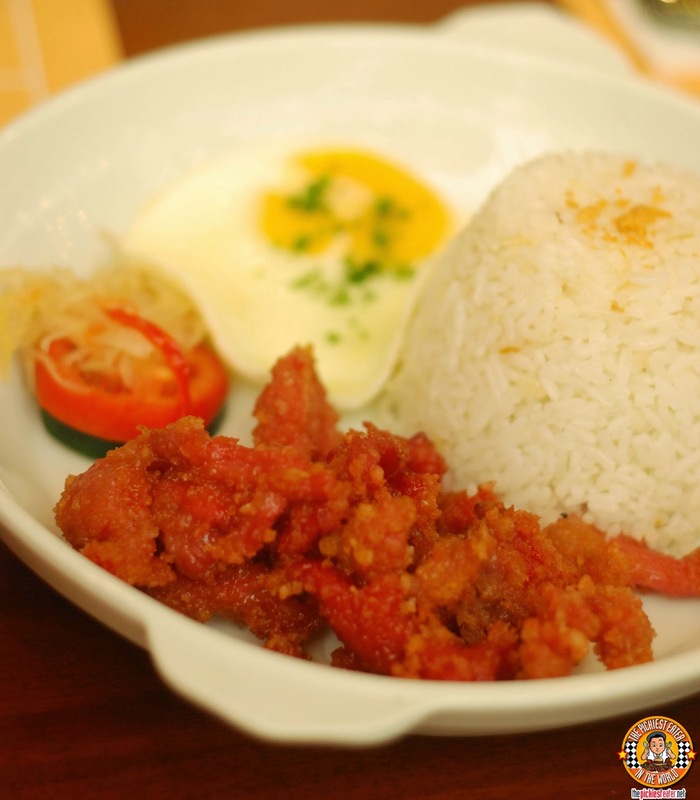 Strips of Pork Tocino dabbed in light breading and fried to a stunning golden tone, and served with a sunny side up egg, and delicious buttered garlic rice. 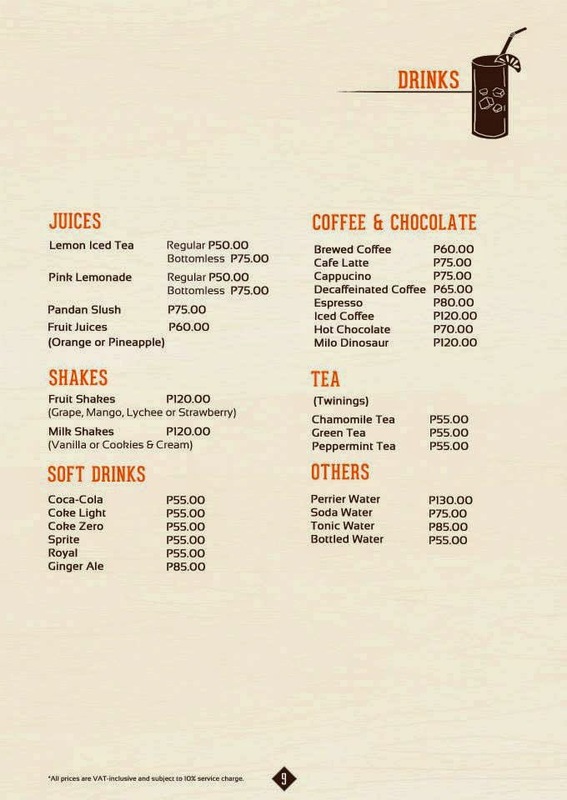 Something you MUST definitely try when you visit Torch! Suddenly the room got quiet. The water came to our table, carrying with him a massive piece of meat on a wooden slab.. The Steak was so big, it made me ask out loud, "Did someone order Brontosaurus? ", because it looked something straight out of the Flintstones. 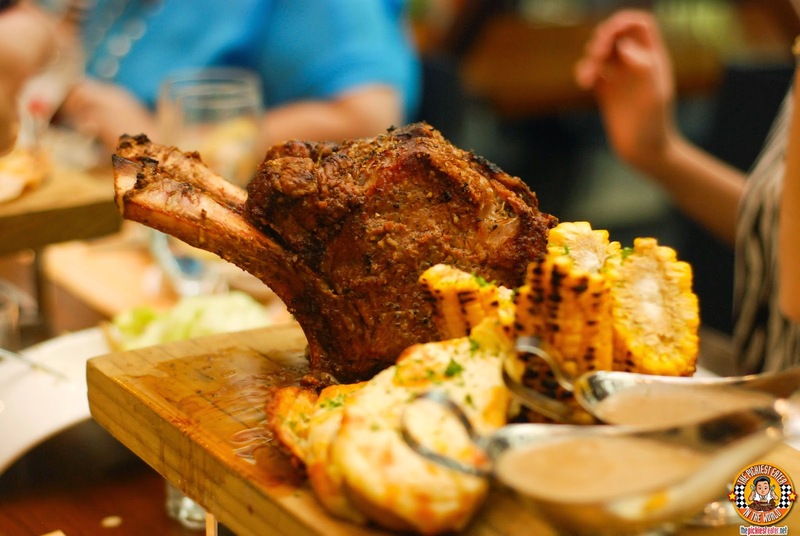 As delicious as the other dishes were, everyone was eager anticipating the arrival of the Tomahawk Steak (P6,799.95 - Full 2000-2200g/P3,499.95 - Half 1000-1100g/P 1,195.95 - Single 300g). The behemoth of a steak was rubbed in Torch's secret dry rub, and roasted to wonderful medium rare, allowing the natural flavors of the meat to blow your mind away to smithereens. 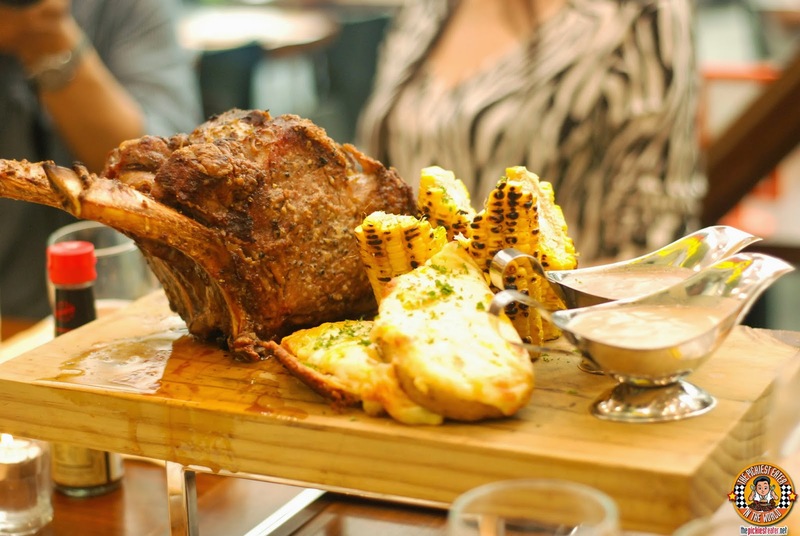 The full Tomahawk Steak of @torchresto! @bertoinbrogues @ageeromero @nineslicad @pepesamson @theskychic YOU MISSED THIS!!! Definitely an amazing piece of meat and perfect for sharing if you're a big group! After an amazing batch of appetizers and entrees, our hosts delivered a knockout blow by bringing out a slew of desserts to end our meal. 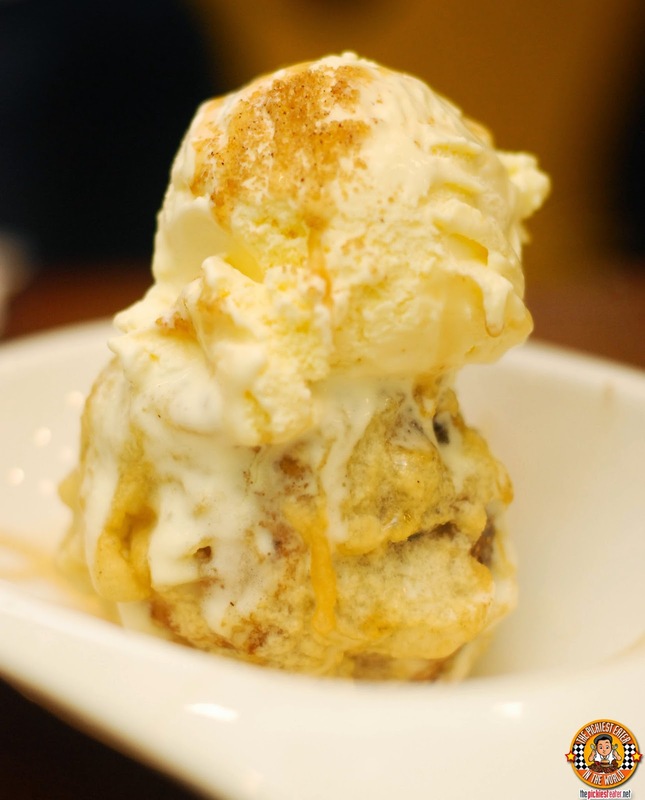 Torch also has a unique Fried Bread Pudding (P149.95), which was served ala mode! Awesome!! 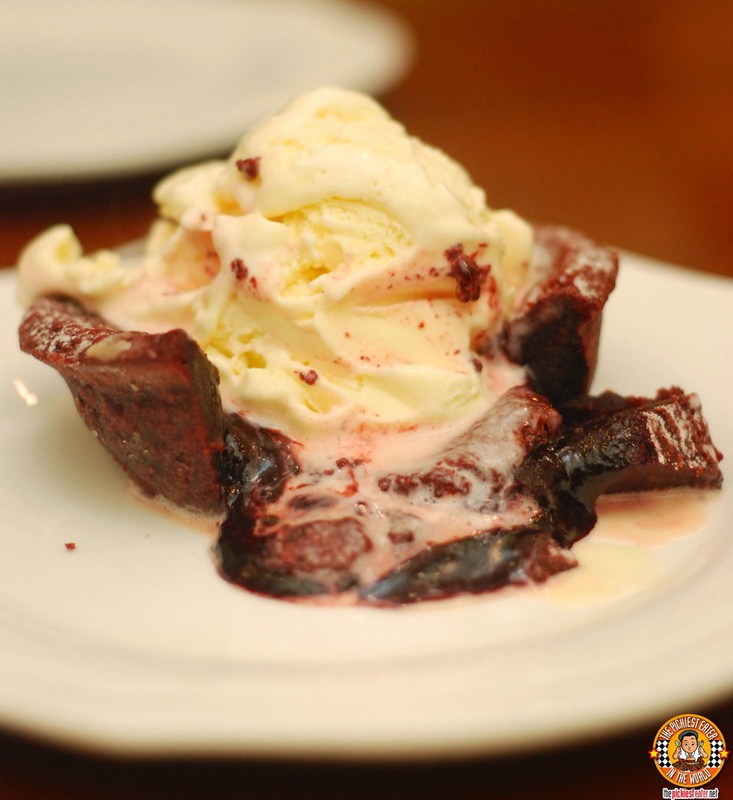 Another new item of the menu was the Red Velvet Lava Cake, which was delightful without being overly sweet. 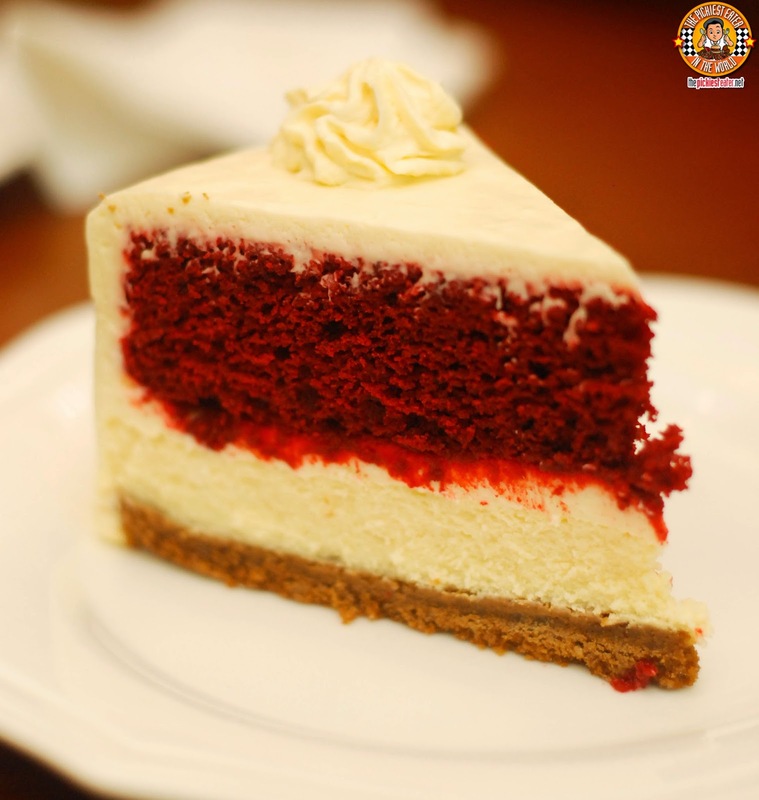 Another winner was the Red Velvet Cheesecake (P295), which had a nice touch of tartness, to go with a lovely creaminess. One layer is a vibrant red velvet cake, perched on top of a light cheesecake, and covered in a stunning cream cheese frosting. With four branches now scattered around the metro in just a couple of years, Torch has grown into one of the local restaurant brands to watch! I have no doubt we can expect even bigger things from Torch in the future! Like Torch Restaurant and Bar on Facebook! all three were delicious, Edelweiza! You had me at Dragon Sangria.